Stay by the waterfront at this Ludlow ski cottage! With a firepit to warm up next to and room for six, you'll love this family getaway. 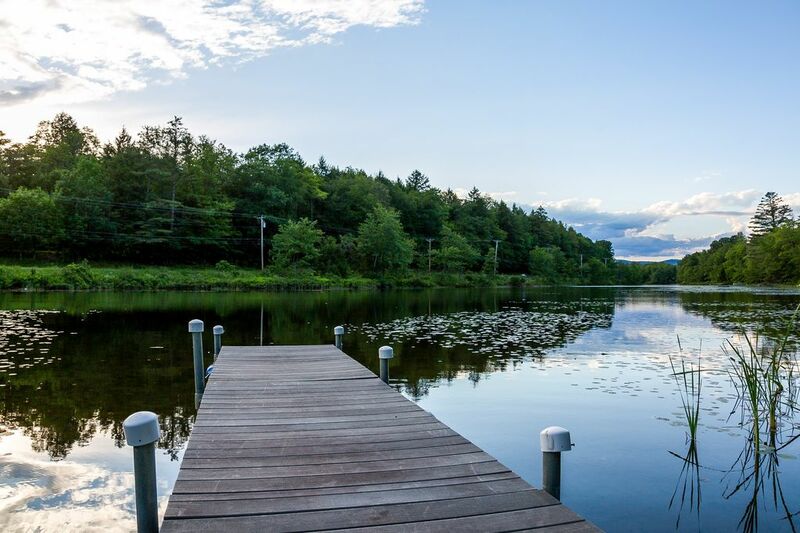 This home is just a short walk (across the street) from the shore of Lake Pauline and about one-and-a-half miles from Okemo Mountain Resort and less than 15 miles from Killington Skyship Base Lodge. Bring your skis, snowboards, and snowshoes (or rent some), and enjoy the freshly fallen powder up close. In summer, you can borrow the canoe or the kayaks from the boathouse and take them over to Lake Pauline. Quaint, quiet, and cozy, this inviting home sets the mood with comfy, down-home furnishings and modern amenities, all while staying bright and airy. Convene in the living room around the electric fireplace with tales of the slopes, or settle in with a DVD or show on the satellite TV. If you're more into conversation over music, stream some with your phone over the WiFi or play a CD with the surround-sound stereo. In the full kitchen, you'll have the cooking tools you need - just provide your favorite vacation foods! Plus, you'll have a six-seat table to enjoy meals at. This family home offers one bedroom and a loft. There's a queen bed for folks in the loft, two twins for the kids, and even a futon for two more guests. A full bathroom with a shower stall and washer/dryer will make you feel right at home. From the slopes to the syrup souvenirs to bring home, there's so much to find in this part of Vermont. Besides local maple syrup, the area boasts delightful dairy as well. Visit Plymouth Artisan Cheese, founded by the father of President Calvin Coolidge. Continue shopping with a day trip to Manchester just about 30 miles away. Stay at this country cottage for your next winter or summer vacation! Parking Notes: Parking is to the right of the walkway (before the house as you go down East Lake Rd) that leads to the back entry. Please do not drive or park on the lawn. Dock Details: Summer only. Please ask local manager if dock is up. Access is across the street from the boathouse. Motorized boats are not allowed on the lake. The home is on the outskirts of the cute town of Ludlow. The house has good wifi, nice beds, well supplied kitchen. Only one bathroom, but it was fine. Would return to again. Small spot perfect as a place to crash and only steps to Okemo. Very clean and perfect place for time away. Sweet Pauline Cottage is very sweet! Lovely house , great location.